There are tools that I am very grateful that someone created them. They are useful and do their specific job well. Things like notepad++, and if you work with events – the GcalToolKit: If you work with multiple google calendars and use calendar ics files frequently, then you may well find yourself one day in a spot of bother. So today I want to give many thanks to Neil Gerstenberg for his Google calendar toolkit. Modifications to events, especially to an instance of a recurring event, or an update to a modified instance can all seem quite complex. It’s not that bad once you understand the various bits that you need to provide for the receiving application to make sense of it. See the RFC5545 spec for details. This tools.ietf.org version or icalendar.org or the kanzaki version. RECURRENCE-ID – if modifying a single instance with in a recurring stream. Note that for a UID and SEQUENCE pair, the “RECURRENCE-ID” value for a recurrence instance is fixed. The event date may change but the “RECURRENCE-ID” does not. It must always be the original date as generated by the RRULE. if an ics file is imported (eg: when event details are sent as an ics file attachment, not as a url, or if the user downloads the ics file from a url and then imports it), then it will be added as events into the calendar chosen by the user. Updates may overwrite IF the user re-imports the events AND the application is clever enough to match up the UID’s (and RECURRENCE-IDs if it’s part of a recurring set). It should then also use the SEQUENCE to determine if the details are actually the latest. There is no way on devices to force a user to load an updated ics file sent to them. Now, one of the instances gets modified. (This could be just the description or the actual date.) A RECURRENCE-ID VEVENT is created for each instance modification and the SEQUENCE NO is updated. The recurrence-id matches the date in the recurring rule that it applies to. The combination of UID, RECURRENCE-ID and SEQUENCE helps us identify the instance that is being updated. the "RECURRENCE-ID" value for a recurrence instance is fixed. If the UID/RECURRENCE-ID/SEQUENCE matches a generated date from the rrule with same SEQUENCE (ie both have been modified), then what? One cannot just use eg: LAST-MODIFIED:20140620T200327Z. Who is to say that a mod of the RRULE was intended to overwrite the RECURRENCE instance? Quite possibly not. There are a number of date and time options for you to choose when displaying your events. The main ones you should be using are created by the plugin and will be formatted by the date and time settings you have specified in the plugin settings (and applying any localisation that may be available in your wordpress setup). You can specify these by listtype, so say a widget could have a very compact date format and a full list may be more detailed. Note there may be situations where there is no end time or no end date (eg: if there is no duration or the end date is the same as the start date. If a field has not been populated, it will not be displayed and neither will any ‘before’ or ‘after’ text. Field from the ics specification that may be useful. The ‘last’ date shown in the edit events admin screen shows the last recurrence date of an event. It is used to select events within a date range (ie exclude events whose recurrences are in the past, without having to rebuild the recurrence logic). 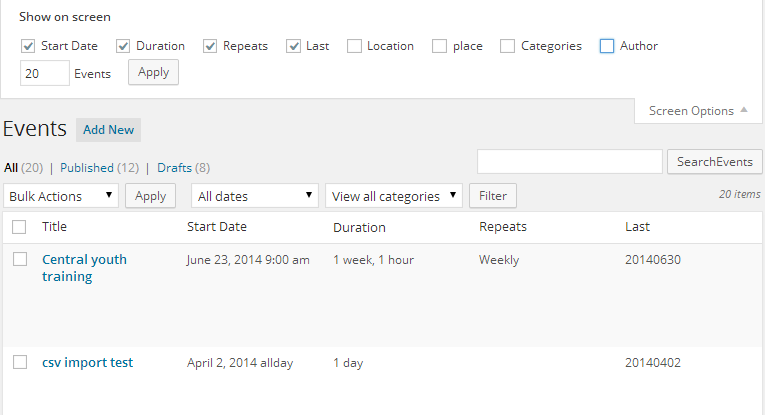 It is also used to sort events in the admin screen by this last recurrence. It is therefore formatted yyyymmdd for the sorting. It is not intended to be displayed elsewhere. These are direct from the ics specification formatted by the DateTime settings in the plugin settings. Note the DTEND has a special definition in the ics specification for all day events (it will have the next day as the end date) and may be confusing to normal users. Some ics generators get the DTEND logic wrong, so this plugin tries to work with duration just in case. As these are very technical, precise fields, they are by default not formatted but left as found. the date and time that the instance of the iCalendar object was created. the date and time last modified – works with the sequence number to determine the latest modification to an event instance. I’m fully aware of how complicated and dangerous working with timezones can be, especially if recurring events and daylight saving are involved. So when I decided that I wanted my kids school timetables in ics format and that I’d ‘outsource’ the manual data entry of it, I took great care to setup the calendars myself, specifying the Australia/Sydney Timezone. I found a great person on elance based in the states who was knowledgeable about google calendar and recurring events. I shared the time table calendars with her. She set up the events in the two timetables. I checked it and all was good for a few weeks. Then the normal Sydney (NSW) daylight saving period ended. And NOW all the timetable events were TWO hours out – yes two (2) ?? why? Being knowledgeable in these matters and having done SO many tests with timezones changing daylight saving at different overlapping times etc, I knew that it must be something to do with timezones. I logged on to google and could not find anything online that told me anything. Timetable calendars still set to Sydney, but all the events now mysteriously 2 hours out. I downloaded the ics file to see if that would shed any light. The ics file had a timezone definition for Australia/Sydney AND for America/New_York and ALL the class events were defined with timezone America/New_York. Now google very clearly says that it stores the events in UTC / GMT time. why not just one hour out? Had I missed the New York daylight saving change on 9 Mar? Maybe ? The times are just of the hour like 10.50 instead of 8.50 – maybe when I saw 9.50 I just thought 9 ? who knows? How to avoid unintended timezone daylight saving clashes happening again ? Well I’m guessing – it appears google will use the timezone of the person creating the event EVEN if the calendar is in a different timezone AND this timezone is NOT shown when one looks at the event, NOT even in event debug / troubleshooting mode (add &eventdeb=1 to your google calendar url). The creator has to manually assign a timezone to each and every event to ensure that it gets exported correctly. How to fix the current timetables offset by two hours? I didn’t want to delete the existing calendars and Google allows no other easy way to delete events from any non-main calendar other than deleting the whole calendar. For example: Even if you have deleted the events and want to re-import them, google will not let you. To fox it – do a gloabl change on the @google.com of the UID . Events are identified by UID. At one stage I even felt I needed to change the file name and calendar name, but perhaps I was just tired, confused and annoyed by then. BACKUP all your google calendars and possibly other data first before letting another app mess with your data. Create a TEST calendar to test the whole process. Export your ics files, create a backup copy. Use something like notepad++ to do a search/replace on the timezone. Make sure your new timezone is something google will recognise and the correct UTC offset. Save and close the ics file. Make a cup of tea – ieWait a few minutes, sometimes it takes google a while to update. Import the ics file and check the times. We don’t the search spiders to use too much bandwidth while they crawl. March 2012 in Australia has been very wet - the spiders don't like it any more than we do! 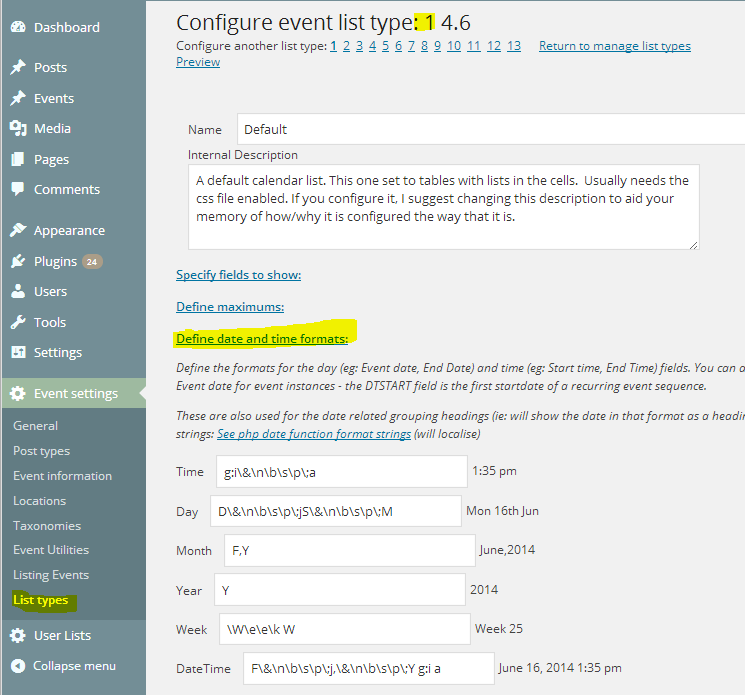 The events plugin does what it can to help get your events indexed (see below). Dynamic event lists change frequently (daily or more?) as time goes by – they drop off old events and show the newer ones. These frequent “updates” could perhaps cause more attention from a search engine. Widgets (box and calendar) that have internal links back to the main calendar page can also make google think that page is important. Especially if those widgets are on every page. Maybe that is what you want, and maybe it is not! You may need to control it. You the webmaster can help the seach engine spiders or crawlers further to index your site while not chomping all your bandwith. the plugin uses wordpress as much as it can, so you can integrate other plugins to maximise Seo. Seo plugins can be used on event posts, as can Social plugins. 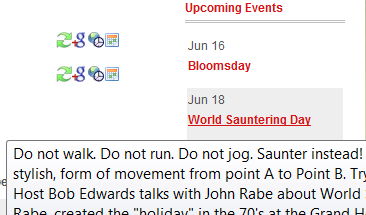 Also we should consider sidebar widget issues – links on every page that point to the same may overly highlight the calendar page and make it more important – sometimes this is intentional and sometimes not. Related question via Brad Gosse: 2010/12/06/do-tag-clouds-in-sidebars-affect-seo-ranks? Should the widgets have no follow links on certain links ? …. but we want that indexing….maybe just the rel control? What to do about html in event descriptions? Some applications will cope with the html, but there are other applications which do not. EG: Google calendar – does not faciliate html nor issue it in feed. 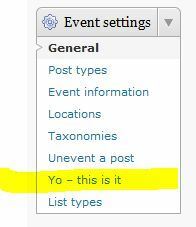 WordPress allows us to create events with html in them. So what to do when the ics feed is generated? DESCRIPTION;ALTREP="http://www.example.com/somepath/":This is an example description. Problem with Dates/Time – Off by 1 Hour? If you are using amr-events or amr-ical-events-list you will not have this problem! Imagine the confusion this can cause where clients may have subscribed to calendar feeds and have the wrong times. If people are very lucky, the plugin that they are using has some good coding and is using php DateTime objects with timezone support, and the only problem is that their wordpress timezone is set as a GMT offset, not as a timezone. most importance of managing recurring events in one timezone for a display in another where one zone changes daylight saving. Very easy to generate the wrong times for a recurring event without realising it! Change to use php DateTime Classes for all date logic .If they are using unix time and not php datetime objects, it is almost impossible to get it right. It’s a fairly major rewrite to change all date logic to use the DateTime objects and functions. If already using, it maybe that the intricacies of recurring event logic have won out. See below for logic help. WordPress events plugin with xml output? want it? why? The IETF (Internet Engineering Task Force) has just published the RFC (Request for Comment) for xcal (iCalendar in XML). Given that the ics format works fairly well to give us calendar exchange and interoperability (given the natural constraints of human involvement in import/subscribe to their calendar apps) , does one need an xml format too ? An argument for the existence of an xml standard is that people have already developed their own xml versions – a standard was required for interchange of data. If you have thoughts on this and would like to see that this wordpress events plugin produce an xml icalendar feed as well as the ics feed, please add a comment below. Try to be as specific as possible as to the reasons and benefits to motivate the addition of the xml format – export (and hmmm maybe import). Google and many other calendar providers already offer both ics and xml. I think the biggest software revolution of the future is that the calendar will be the organizing filter for most of the information flowing into your life. You think you are bombarded with too much information every day, but in reality it is just the timing of the information that is wrong. Once the calendar becomes the organizing paradigm and filter, it won’t seem as if there is so much. By the way, did you know this plugin already issues the necessary css classes for the hcalendar microformat? Using amr-events with internal events? Your events all have a link to their post or custom post type. Using amr-ical-events-list (or an external ics file)? Have you ever wanted to change the original text for a plugin? Do you have an audience who would respond to their unique way of speaking being used on your website? 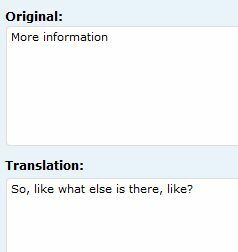 Even if you’re english and it’s in english you can still “translate”. Update on 2016 October 7th: This is all much easier now with the use of a plugin like https://wordpress.org/plugins/loco-translate/. Simply ensure that the language for which you are adding a new text / translation is one which is either the main wordpress language or selectable by your users. Already have system translations in that language? Drop the code at the bottom of the post into your plugin or theme’s functions.php. Decide which locale code to use- the default wordpress language for your site (for English it is en_US) or a variation ? (en-GB, en_au ) . If not using the default you will need to change your wp-config.php file to tell your wordpress your preferred locale. Don’t like the menu text ? translate it! Just pick a few key phrases (they must be translateable) to make an impact. Your website could talk like a pirate just for a day – drop the .mo file in on the day and delete it afterwards! An upgrade may overwrite your translations, so save it somewhere other than the main plugin language folder . The amr-events plugins looks for language files with the plugin language text domain in the wp-content/languages folder before looking in the normal place. The loco translate plugin offers you choices as to where to save your translation files. Locating your language file for the amr-events plugins in the wp-contents/language should be safe from upgrades.